An interview posted in honour of the late Secwepemc Elder and Warrior Wolverine upon the occasion of his recent passing, that includes him speaking about legal principles of Native land title and rights in Canada, a legal fight concerning land rights that he was involved with from 1989-95, and the softwood lumber agreement issue. The article written at the time of this interview is below, but the interview audio itself has not been published until now. Following the article, is the text of the December 2015 open letter from Wolverine to Canada’s Prime Minister and Minister of Justice calling for a public inquiry to address what happened around Gustafsen Lake. 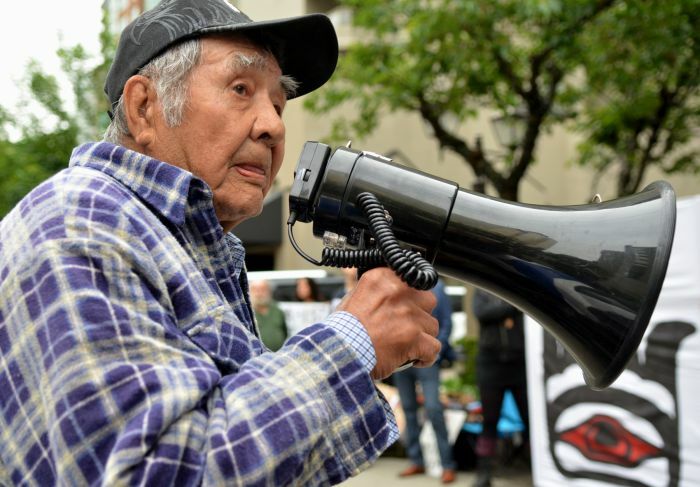 Native elder, youth talk of defending their land in B.C. How many times do you get to hear a speaker talk about being chased by a Canadian armoured personnel carrier, coming within four feet of being crushed and then shooting out the hydraulics with an AK-47 to take away the steering? A few dozen UW students recently took advantage of the opportunity when William “Wolverine” Ignace and Nicole Manuel spoke in Waterloo on Tuesday, November 19. They’re from Secwepemc Nation near Kamloops B.C. and are raising awareness of the fight to protect their homeland from being further destroyed in the illegal expansion of the Sun Peaks ski resort. They said neither the provincial nor federal governments will enforce the laws that protect the Native peoples’ land rights. The dispute was at the centre of the 1995 Gustafsen Lake standoff, when over 400 RCMP and Canadian army personnel employed land mines, concussion grenades and thousands of rounds of ammunition to stop the Native people’s attempts to defend their land. It was during that time that the 63-year old Wolverine found himself in combat with the Canadian army and he spent the next five years in jail for his participation. But the two had much more to talk about. Twenty-five-year-old Manuel spoke of the leadership she and others have received from their elders, including Wolverine. Although his formal education only went to grade seven, he has done legal research into the Native peoples’ land rights and represented himself in the courts, right up to the top court in the country. He pointed to the key 1995 dismissal of their case by the Supreme Court that didn’t rule on the legal points that Wolverine contends stand firmly in favour of the Secwepemc people. He says that the Secwepemc should have their dispute with the Canadian government heard by a third-party adjucator, because that is the only way to avoid the conflict-of-interest that any Canadian court or judge has in hearing the case. He stated that First Nations are allies with the Queen, not subjects to her. In his research, he’s found that “there’s only six times in North American history that the Native people’s title and rights have been discussed in law” and they show the right to third-party adjucation. He listed them as 1704, the Mohegan people versus Connecticut; the appeal of that case in 1740; the Royal Proclamation of 1763; the conclusion of the Mohegan case in 1773; the Duty of Disallowance in 1875 and the 1982 Constitution. However, there is one legal avenue left: preventing an agreement between Canada and the United States on softwood lumber. “We can destroy the economy of Canada. Maybe that’s what it takes for people to realize what is wrong with this country. “Because they never dealt with the land issue, all the resources that are removed off of our territories, it’s all stolen goods.” He said that Canada challenged this all the way to the World Trade Organization (WTO) in Geneva, but lost. Wolverine said he has two goals: justice and coexistence. The tour he and Manuel are doing now is criss-crossing Eastern Canada; after visiting Concordia University, students there picketed two Montreal travel agencies, convincing them to cancel tours to Sun Peaks. Waterloo students at the talk were discussing doing a similar thing here. My name is Wolverine. I am also known as William Jones Ignace. I am an 83-year-old father, grandfather and great grandfather, and an Elder of the Secwepemc nation in what is called British Columbia. I am a farmer. This past summer I cultivated eight acres of organic food to nourish the people in my nation and other nations as well. I am a long time defender of the inherent jurisdiction of Indigenous peoples to steward our traditional homelands. In 1995, after a long history of peaceful attempts to have Secwepemc sovereignty respected, Indigenous people from the Secewpemc nation and their supporters took a stand on sacred Sundance lands at Ts’Peten, a.k.a. Gustafsen Lake. The incident began after a local white rancher, Lyle James began demanding that the sacred Secwepemc Sundance Camp leave land to which he claimed ownership. Approximately 24 Sundancers set up camp to defend Ts’Peten. I was one of those people. Despite the 20 years that have passed since the Ts’Peten standoff, the core issues that so forcefully clashed against each other remain at the forefront of the hearts and minds of Indigenous people. That is our right to self-determination, autonomy and protection from the dispossession of our lands and territories. According to the Royal Proclamation of 1763, Aboriginal Title to land exists inherently and will continue to exist until it has been ceded by treaty with the Crown. The land on which the Ts’Peten standoff occurred was, and remains to this day, unceded territory. The land at Ts’Peten was never handed over by the Secwepemc Nation to Canadian control through treaty or otherwise, and is therefore land that cannot have been sold to settlers by the Canadian or British Columbian governments. The use of Canadian paramilitary forces against the people of the Secwepemc nation asserting our inherent jurisdiction and title over our own territories therefore is a serious abrogation of the Nation to Nation relationship between the Canadian government and the Secwepemc Nation. In recent months, Mr. Trudeau, you have called for a renewed Nation to Nation relationship with Indigenous nations, promising a new era of recognition, rights, respect, co-operation and partnership, rooted in the principles of the United Nations Declaration on the Rights of Indigenous Peoples. According to that Declaration, Indigenous peoples have the right to be safe from being forcibly removed from their lands and territories. Even now, aggressive resource extraction and the destruction it inevitably brings regularly occurs on Indigenous lands without the consent of Indigenous peoples. Indigenous lands which, according to the very agreements that founded the nation of Canada, do not belong to Canada to be given away without the free prior and informed consent of the Indigenous people of those lands who never relinquished their rights. In order to build this Nation to Nation relationship, Indigenous peoples must know that they can continue to pursue peaceful processes for protecting their sovereignty, without the threat of state sanctioned violence being used against them. The use of police and RCMP intimidation and force as a method to settle land claims in favour of the Canadian national and provincial governments is antithetical to the creation of a healthy and just partnership between nations. If Indigenous people are prevented from asserting their rights to sovereignty, true reconciliation cannot occur.